This was my first attempt at a layered chocolate truffle. As part of my chocolate studies, I’m currently developing my 5 ‘signature chocolates’. There must be one of each of the following centres: a cream ganache, a butter ganache or fudge, a fondant or layered centre (one layer pate de fruit, one layer ganache), a caramel, and a nut-based centre (can be layered with another filling). This chocolate truffle is to fulfil the nut-based centre specification. And it’s also a rise to the challenge from Anna, who has been asking me to make this since I started the course. It is inspired by the Great British Bakewell Tart. There’s a layer of raspberry ganache, topped by a caramelised toasted almond gianduja, and a layer of almond paste, all wrapped up in chocolate. There were many steps in the process of making these. 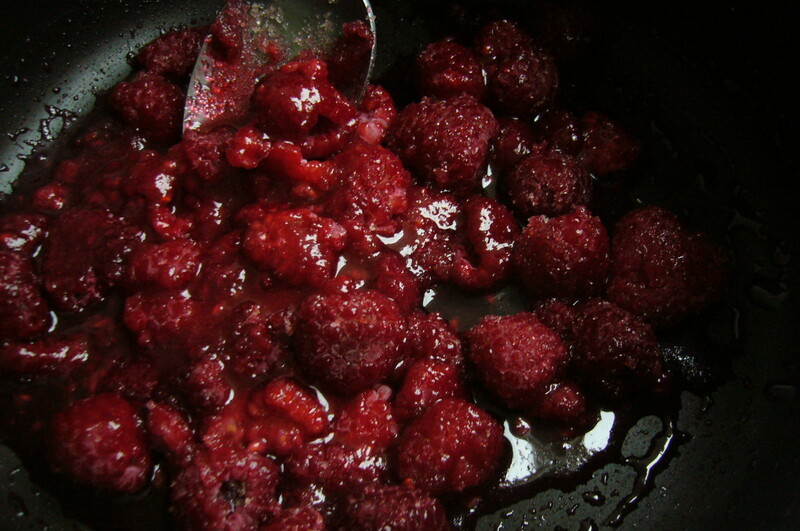 First, I made a raspberry puree by boiling down raspberries with sugar, and reducing them by half to get a concentrated flavour. This became one of the two essential ingredients in the dark chocolate raspberry ganache. 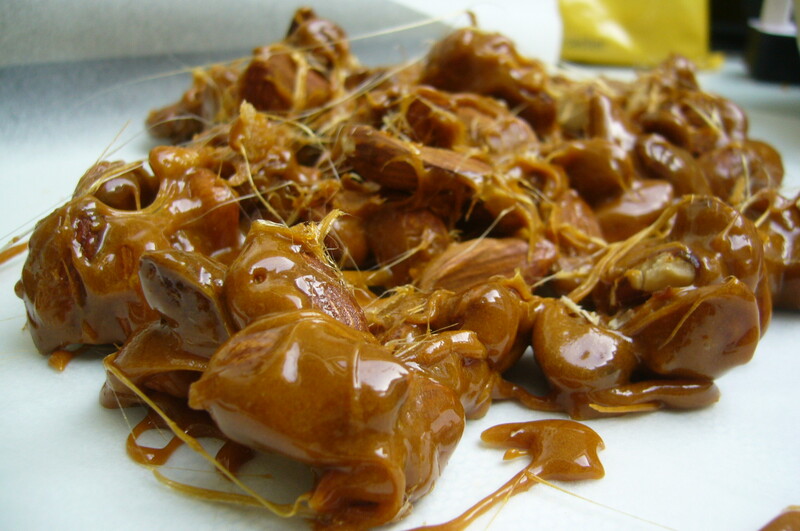 Next, I toasted the almonds, caramelised some sugar and made almond brittle. This was pulverised into a yummy caramel crunchy nutty paste, and mixed with melted chocolate – half white, half milk. Mmm-mm. This is the gianduja layer. 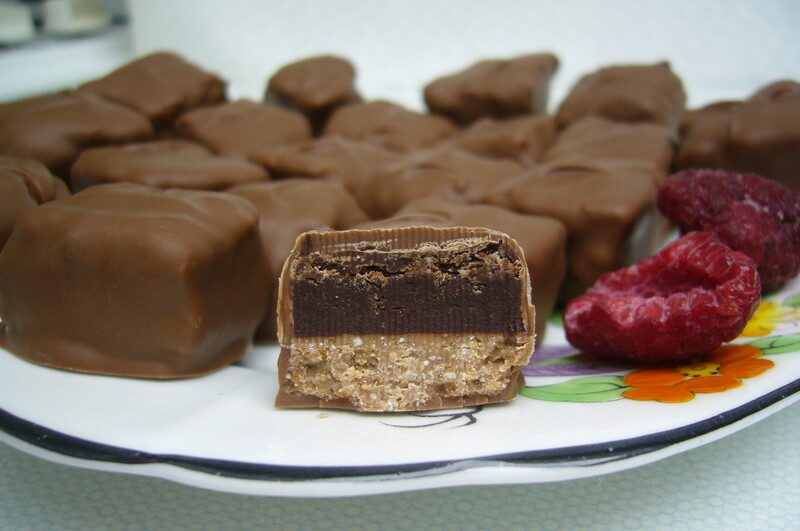 I layered the two together – pouring first the raspberry ganache, trying to make it as even as possible, letting it set, then smoothing the nutty gianduja on top, followed by the almond paste. I flipped the whole thing over and applied a chablon to the bottom, which is a thin layer of chocolate to enable you to hold the chocolate on the dipping fork, and also to ensure that there is a sufficient layer of chocolate on the bottom of the truffle. This huge slab of yum was cut, hand-dipped in tempered milk chocolate, and decorated with a little flick of the dipping fork. And finally, the finished article! It is, I think, quite Bakewelly. I hope I have done the Tart justice. The almond paste comes through well, in a sort of marzipan way, the raspberry ganache is tart and fruity, and the caramelised almond gianduja gives the whole thing sweetness and a bit of a crunch which reminds me of pastry crust.